Next Sunday the Seattle Seahawks play the Washington Redskins in the first round of the NFL playoffs. The Seahawks finished the regular season a half-game behind the 49ers in the NFC West which makes them No. 5 seed. The Redskins beat the Dallas Cowboys last Sunday to win the NFC East title. However, it is the Seahawks which the bookies have predicted to win this game with odds of 10/13, the best odds available on the Redskins are 5/4. The Redskins are lead by one of the NFL’s stellar rookie quarterbacks, Robert Griffin III. This game will really be a battle of the rookies as Griffin faces Seattle rookie quarterback Russell Wilson. Both players are being considered for NFL Offensive Rookie of the Year. However it is thought that Griffin has the advantage due to his higher passer rating, his No. 2 pick in the NFL Draft and the fact he plays in the East Coast. 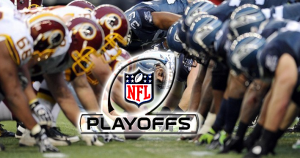 The Redskins finished the regular season with a 10-6 record, they have had notable wins this season against teams such as the New York Giants, New Orleans Saints and Baltimore Ravens, and they also had a seven-game winning streak leading into the playoffs. However, the Seahawks have won their last five games of the regular season and seven of the last eight.